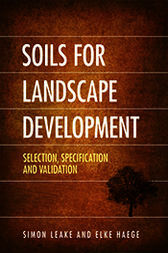 Soils for Landscape Development provides a clear, practical and systematic template for specifying landscape soils based on scientific criteria. The soil specifications provide essential information and a universally applicable method for landscape architects and designers, specification writers, landscape contractors and soil supply companies to ensure quality and fit-for-purpose soils. A strong emphasis is placed on reducing environmental impacts by reuse of on-site soil, promoting appropriate minimal soil intervention, and using recycled products.